3. An interview with Dr. Wall in April 2001. 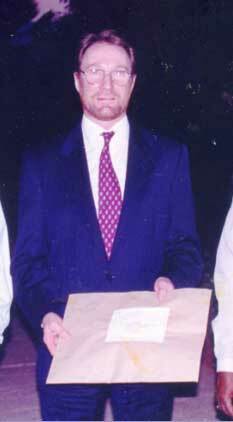 On 24th March 1997, Dr. Wall and forensic expert Dr. Purandare extracted 5ml. blood from Swamiji in Court. They were then officially allowed to proceed to Hyderabad where tissue samples of the supposed foetus from Aruljothi were handed over to Dr. Wall. “James Watson, a qualified scientist and Paul Debenhum, another qualified scientist, carried out the necessary experiments on these two samples in collaboration with me and under my direct supervision. Paul Debenhum is the Director of the Laboratory and a very qualified scientist of international repute and a specialist in this branch of science. The total experiment upon samples took about three weeks. The final results became available on 20th April 1997 and I caused a report of the Laboratory to be sent to the Honourable Court in time. … The conclusion is that it is impossible that accused Premananda, whose blood I extracted before this Honourable Court, is the father of the foetal tissue which was handed over to me by Dr. Rao in Hyderabad and which, in turn, I delivered to the Laboratory in the UK…the Laboratory has not exhausted either the accused’s blood or foetal material supplied by the Hyderabad Laboratory…I have been instructed by the Defence to inform this Honourable Court that if the prosecution wants to repeat this experiment, the Defence is prepared to pay for the cost of the same. The prosecution can either depute Dr. Singh to do so or designate any other expert of their choice or this Court can appoint a third expert as is frequently done in many paternity disputes in the Civil Courts in England as well as in America. My earlier opinion that Dr. Singh’s methodology and conclusions are both wrong is now rendered 100% conclusive by the findings of the UK Laboratory. Question: Can an exclusion of 100% be done by using DNA analysis? Dr. Wall: Yes, it can and I’d like to explain how I come to this conclusion. When you analyse DNA, if you get a match between two samples, what you are really saying is that there is a probability that these two samples originated from the same person. When you get two samples which don’t match, they cannot have come from the same person. Therefore, certainly we can be sure when we have an exclusion, one hundred percent. When we have a match, that is when two samples correspond, we cannot be hundred percent sure that it is from the same individual. In the same way as if you know that a cow has four legs and you see an animal in the field with four legs, you have a match – they both have four legs. But you only have a probability that the other animal is a cow – it could be a horse. Now if that other animal had eight legs, you know that it can’t be a cow and it is a hundred percent sure it is not a cow and that is where you get the exclusion. And that is where when you get a match, you only have a probability that the two correspond exactly. Question: Another point raised by the Judge referring to the S.T.R. tests [Short Tandem Repeats Test] carried out under your supervision, was that without the blood sample of the mother, the test presented by the defence is highly unreliable. According to her, without the blood sample of the mother, there cannot be any proper interpretation of the DNA profile of the aborted foetus. Dr. Wall: … The results we achieved was from the aborted material. We managed to get two complete profiles, one from the foetus and one from the mother. It doesn’t matter which one is which, because neither of them could have been fathered by Swami Premananda. Had one of those profiles matched, then we would have had to have asked for a sample of blood from the mother. But since neither of them did, there was no use, no point in having a sample from the mother. It comes back again, if you have an exclusion you have an exclusion and no further testing will make it any different or give you any more information. Question to Dr. Wall: The Judge stated “When the experts contradict one another, the evidence of that expert which synchronizes with the oral evidence has to be accepted…the evidence of PW59 (Dr. Singh) and the conclusion of the DNA Fingerprinting is unassailable” that when the experts contradict each other, the evidence of the expert which synchronizes with the oral evidence has to be accepted. The question here is whether this is a common practice in cases where experts contradict each other. Since the Prosecution results from Dr Singh were so different to my results, and the Court wouldn’t accept my results, I would suggest that a third laboratory is asked to test the samples and start afresh. I think that is really what the Court should have directed. It after all shouldn’t matter to Dr. Singh, and it certainly doesn’t matter to me if I am proved wrong, because we are working for the Court. We want the truth and therefore, if there is such an objection to our results, a third, independent laboratory should be instructed.